All Saints Academy is celebrating a fantastic set of GCSE results with 85% of students having achieved a grade 4 or higher in both maths and English, while 66% achieved a grade 5 or higher in both subjects. The new GCSE grade 9 is awarded for the best performances nationally so we are proud that 5% of students achieved this wonderful accolade in both maths and English. All subjects which changed to the new 9-1 grades saw over 12% of students achieve the top grades of 9 or 8. English and maths results were outstanding with 91% and 89% of students passing with grade 4 or higher. 81% of students also achieved a grade 4 or higher in Religious Education. 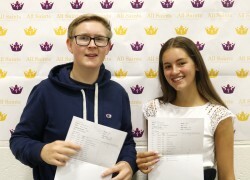 Head Boy Oliver and Head Girl Libby were both thrilled with their outstanding results. Congratulations to all our students, we wish them well in their future choices.